Another Bill Murray’s birthday come and gone. Another week of fielding questions about whether Bill Murray finally decided to show up from people who should probably be able to tell from the disappointed expression on my face that no, my elusive quarry did not randomly show up for his birthday party. If Bill Murray ever shows up to one of these birthday parties, trust me people, you’ll know just by looking at my face. In the meantime, stop asking depressing questions! 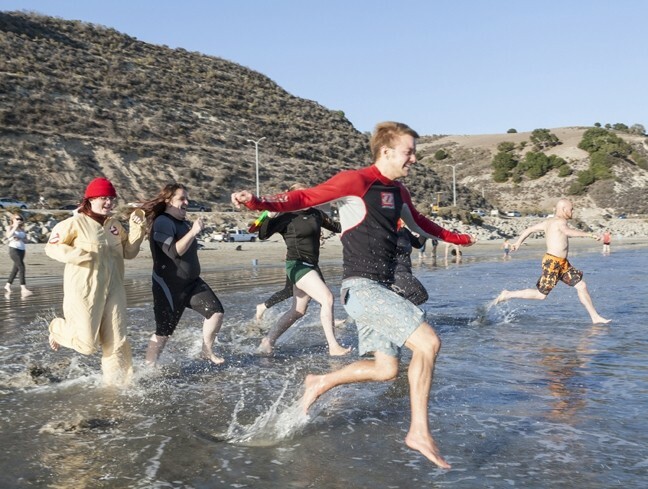 MAKING BILL PROUD: The dash into the Pacific Ocean is an essential component of the annual festivities in honor of Bill Murray’s birthday. Why? It seemed fitting. It’s OK though, because this was our first year celebrating Bill Murray’s birthday with a newlywed couple—Maeva Considine and Aileen Manley, who were married less than 24 hours before the Avila Beach “bonfire” in Murray’s honor on Sunday, Sept. 21. They brought along a good chunk of their wedding party—a lively group that knows how to enjoy itself, even when the Harbor Patrol shows up and insists we remove the leftover wedding alcohol from the beach. Seriously, the consequences of having alcohol or glass bottles on the beach are apparently a $4,000 fine and two misdemeanors, which seems a little overblown considering Al Moriarty’s going to spend less than a year in jail after swindling dozens of people out of tons of money. Given that the Powers That Be had decided to ban bonfires after Labor Day weekend—about three months earlier than usual due to the fact that California’s landscape is drier than British humor—we were pretty much left with some red beanies, a football, a Frisbee, and an enormous kite that I’m convinced could and should qualify as a lethal weapon. 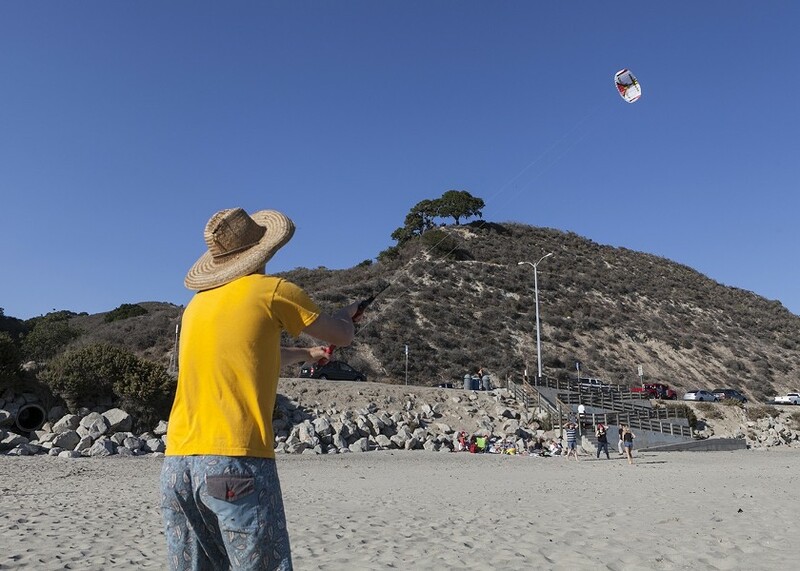 HIGH AS A ...: Aaron Lockwood, who was part of Maeva and Aileen’s wedding ceremony the day before Bill Murray’s birthday, mastered the art of kite flying with only a few near-fatalities. No fire. No alcohol. Thanks, Powers That Be. On the plus side, Maeva’s parents loaded us up with leftovers from the wedding dinner—a Thanksgiving dinner, which was a genius move on the planners’ part and left the guests happy, full, and probably a few pounds heavier. So, the Powers That Be had deprived us of our leftover wedding champagne, but they could never take away our leftover mashed potatoes! And turkey, stuffing, carrots, green beans, and corn casserole, of course. Our elegant spread was a big hit with the friendly beach hornets, who swarmed the food, forcing hungry revelers to really think about how badly they wanted that Thanksgiving dinner before deciding to brave the hornet-infested feast. But we were awash in the holy and comedic spirit of Bill Murray, and it’s a little known secret that his spirit protects his true devotees from hornets, fire, scurvy, STDs, leprosy, irritable bowel syndrome, ennui, tigers, Stockholm syndrome, pirates, and knives. The hornets couldn’t touch us, but I was still worried about sharks during our grand finale: the moment all true Bill Murray fans take a shot, make a toast, and dash into the ocean. 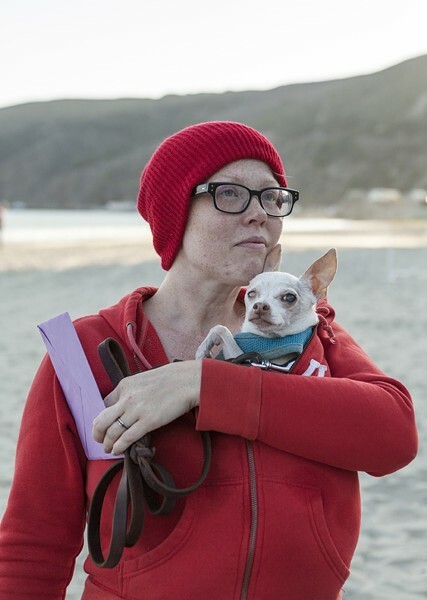 LIFE AQUATIC, AND CANINE: Newlywed Aileen Manley, wearing the red beanie that has become the trademark of this ridiculous event, protected her love Taco from the elements. Without the benefit of a big, toasty fire to warm us up after the dash, we decided to run a little earlier than usual. The wedding party came equipped with wet suits—a decision so practical I had to wonder why none of us had ever thought of it before. We gathered at the waterline—the lovely brides Maeva and Aileen; bridesmaids Tara Celli and Aaron Lockwood, both wearing wetsuits, which I envied; myself, wearing a ghostbuster jumpsuit; Colin Rigley, who had to delay his run into the ocean to photograph our dash; bridesmaids Gary Lavoie and Ryan Gerchman; and Megan Souza. Maeva counted to three, we shouted “To Bill!” and charged boldly into the ocean—hypothermia and great white sharks be damned! It was tough to maintain party enthusiasm after we were cold, fireless, and boozeless, so the party majority voted to retire to Mission Pizza in Avila Beach, followed by the hot springs where, rumor had it, you could actually bring alcohol into the hot tubs. Thus ended the most important holiday of the year—not with a mighty bang, but with a cold, champagne-less whimper. But we did what we set out to accomplish—aside from the very important task of getting drunk. Maeva and Aileen were married. My Ghostbuster jumpsuit was caked in wet sand. And we proved, once again, that we would not let this great man’s birthday pass unobserved, in peaceful silence. Oh no! We raged. We raged against hornets and sharks and the Powers That Be. Maybe one day Bill will join us. Managing Editor Ashley Schwellenbach envies the parties Bill Murray crashes. Send consolation chocolate to aschwellenbach@newtimesslo.com.